Pythons and boa constrictors are just two recent threats facing the Everglades National Park and the Florida Keys. The area is conducive for invasive species to easily establish itself. Warm weather, plenty of water, an abundant food supply all create the perfect haven for alien species to gain a foothold and choke out native life. Of course, any life form that's non-native to an area means it has no natural enemies. This in turn allows it to grow unchecked, undoing the delicate eco-system that is nature. In the Florida Keys, the ecosystem is already balancing on a tightrope. Anything that upsets this fragile blend of perfection can have devastating consequences. A recent study, based upon a systematically monitored roadkill program, is a true eye opener. It shows the top-down affect these apex predators are having on the Florida wildlife in the Everglades National Park. Roadkill numbers gathered over the years before these invasive snakes had a firm grip on the Florida Everglades were compared to recent roadkill surveys. Unfortunately the report results were shocking. Once prolific species of Florida wildlife have been substantially reduced in numbers to the point that some were not documented in the roadkill survey at all. This bodes poorly for not just these species but for the ones that are on the endangered species list. Mr. Bob Reed, noted Wildlife Research biologist, sent us a copy of the Everglades mammal decline report he co-authored entitled, "Severe mammal declines coincide with proliferation of invasive Burmese pythons in Everglades National Park." Raccoons were once considered a major nuisance in the Everglades National Park and now they're rarely encountered. Possum, rabbit, bobcat, fox and deer numbers have also been severely depleted. Wading birds are also at great risk and have been found in the stomachs of these constrictors. 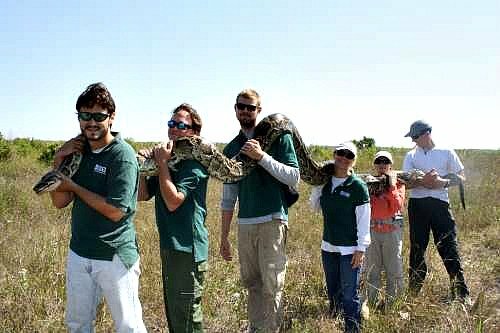 Currently, the Florida wildlife that border the Everglades National Park have not yet been affected to any large degree by the presence of these invasive snakes. However, these invasive snakes have begun to migrate outside the bounds of the Everglades park to areas like Cypress National Preserve, Collier-Seminole State Park, Chekika, Immokalee, Corbett Wildlife Management Area and Key Largo. This means that the Florida wildlife in these areas will soon be impacted negatively as well. Since the 1970's, these invasive Everglades snakes have been living in the Everglades National Park. From 2000 to 2010 almost 1,700 Burmese pythons were captured in the area. As of December, 2010, it's believed that over 30,000 of these alien species are living in Florida Everglades. The Burmese has a strong presence in the area. So do the North African and South African Rock pythons along with the anaconda. Compounding the concern is that the African Rock's have a particularly nasty temperament, and they prefer larger game than the Burmese. This makes them more competitive for food with the larger indigenous species like the panther. What's interesting about the Everglades snakes is the public's response to their presence. Various organizations and agencies have differing theories on the subject. Some conjecture that the 2 species are interbreeding and they'll create a super snake. That's highly unlikely and the end result would actually be a smaller or similar size snake, as opposed to the "feared super snake". The only real concern would be if the "new" snake took on the more aggressive and dominant nature of the African Rock snake. How Are Invasive Species Introduced? There are likely several ways these invasive snakes have entered the area's delicate ecosystem. Many families bought pet pythons, thinking they were a unique or quirky pet. Unfortunately, the snakes grew along with their vast appetite and mean temper. No longer were they a pet that was easy to contain or maintain. Families with unwanted snakes had 3 options. Kill the creature; dispose of it in the wild; or find it a new home. Usually the easiest choice was to dispose of it. Obviously those who chose the easy option didn't pause to consider the repercussions of releasing a large juvenile snake into the environment. Another theory is based on Hurricane Andrew's destruction of the Miami - Homestead area. The Miami zoo and a holding structure for a large number of recently imported Burmese constrictors were severely devastated. Animals, birds, and reptiles escaped when their Miami zoo compounds were destroyed. Rounding up a giraffe, lion or elephant was challenging, but that paled in comparison to finding hoards of slithering reptiles. It was easy for these snakes and other reptiles to escape into the surrounding water and fields. They eventually settled in areas that proved to be the perfect feeding, hiding, and eventual breeding grounds for them. So far, the preferred area for these invasive reptiles has been the Florida Everglades. There's plenty of wildlife to consume, an abundance of fresh water to swim in, and topography ranging from prairie, to slough, to marsh. The thousands of acres comprising the Everglades, plus the River of Grass slough's dense habitat, provide the perfect environment. Since these snakes are semi-aquatic, the fresh water that slowly flows through the Everglades enhances the area's attraction. As juveniles, they can be found not just on the ground or water, but in the trees. Anyone venturing into the area should be mindful of their complete surroundings at all times. The size of these constrictor snakes and their voracious nature presents a serious and formidable threat to all forms of animals - domestic and wild. They also pose a real threat to humans. Not only do they carry bacteria which is harmful to humans, a juvenile python can easily capture and kill a child. A grown constrictor snake can easily capture and kill an adult. Fortunately pythons are not prone to attacking humans, but that doesn't mean it hasn't happened and won't occur in the future. These tremendously large reptiles are eager to strike, and it's very rare for any creature to escape an established grip. They strike with their back teeth and then wrap themselves around their target, squeezing and crushing the life out of their victim. Recently, one was found with a 72 pound deer in it's stomach. Another was found with a 6' alligator inside. 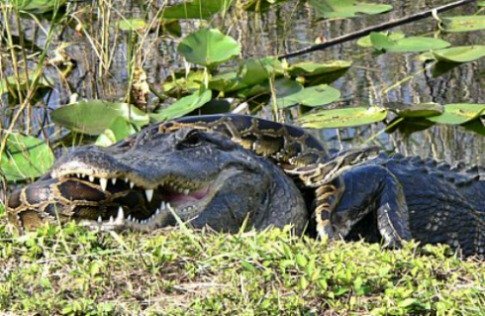 If an alligator can't win a fight against one of these monster snakes, how can the family dog, or a small child escape unharmed? A paper released in March, 2010 determined that 25 species of bird had been found in these snakes stomachs. The endangered wood stork was included in this count. Also, the endangered Key Largo woodrat has been found in constrictor stomachs. The effect these alien snakes have on the Everglades endangered species is cause for alarm. Voracious eaters, the damage they can inflict on non-endangered species is equally worrisome. They could negatively tip the scales by decimating the numbers of birds, rodents, reptiles and mammals in the area. Fresh water is a critical resource for these snakes to survive. They can live for a number of months in brackish water - a combination of fresh and salt - before dying from the effects. However, a recent discovery has startled scientists. These snakes have a greater tolerance for saltwater than was originally determined. They can live at least one month in saltwater, providing they have even limited access to freshwater for drinking. This discovery means they can easily swim from the sloughs and marshes of the Everglades National Park, across Florida Bay and into the Florida Keys. With their ability to tolerate saltwater, is it then possible for them to swim to the Bahamas or Bermuda during the rainy season? 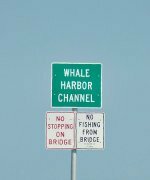 Currently, only the occasional one has been discovered in the Florida Keys. It's not known if a breeding population has been established in the region, but the opportunity to gain a firm foothold is likely not far off. These 3 snakes are not the only concern for the Florida Everglades. 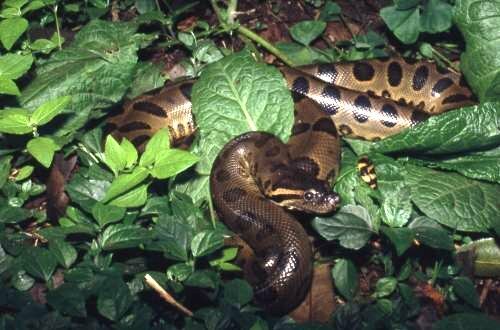 Sightings of anacondas, deadly king cobras, and highly poisonous green mamba snakes have been reported. Add the large and poisonous Nile monitor lizard to this equation, and you have a whole set of new challenges facing the region. Compounding the problem is that these reptiles refuse to stay contained. They're migrating north, east and south. Large monitor lizards have been seen in the canals of Cape Coral, FL. A cable repairman was bitten by a green mamba in Hollywood, Florida. In 2008, to help control this movement, A Nature Conservancy Program called "Python Patrol" was introduced. When a snake is sighted, the individual can call Florida Fish and Wildlife Conservation Commission's call center at 1-888-I'VE-GOT-1 to report the snake sighting. As part of the patrol effort, an "Eyes and Ears" team has also been created. This consists of workers from a variety of industries ranging from FedEx employees to meter readers. When a snake is spotted it's reported and trained handlers arrive to apprehend the reptile. Over the years a number of measures have been implemented to help control this invasive species situation. In 2007, laws were passed prohibiting the sale of seven constrictors and the Nile Monitor lizard. Any reptiles purchased prior to this point were 'grandfathered in' and classified as reptiles of concern. In 2010 the status of these reptiles was changed to conditional species. Anyone possessing any of these 8 species was now required to obtain a permit, have the reptile micro chipped, and ensure it was properly contained in a cage. The newest Federal Rule passed January 19, 2012 further restricts snakes for sale, and also introduces large and serious penalties for anyone caught releasing one into the wild. To learn more about the issues facing the Everglades and the Florida Keys read our interview with Bob Reed. He's a noted Research Wildlife Biologist for the Invasive Species Science Branch of the USGS in Fort Collins, Colorado. The boa constrictors, pythons and other reptiles have set up home, and unfortunately they're here to stay. Efforts to eradicate them will be next to impossible, so control is the only viable option. One positive step that was taken occurred January 2013. The 2013 Python Challenge was designed to create greater public awareness through education and participation. As part of the Wildlife Foundation of Florida, the Florida Fish & Wildlife Conservation Commission partnered with different entities to coordinate the first organized harvesting of pythons. The 2013 Python Challenge brought together the public and registered python holders in an effort to systematically harvest pythons for a month long period. On Saturday, January 12, 2013, a free educational event took place at the University of Florida Fort Lauderdale Research and Education Center located in Davie. The session was designed to teach the public how to properly identify the invasive snakes and to safely harvest them. After the month long harvesting campaign, another free educational event combined with an awards ceremony was hosted. Held Saturday, February 16 at the Miami Zoo, awards were given for the longest python, and for the most harvested pythons. By promoting participation, education and awareness, this event was an important first step in controlling this problem. 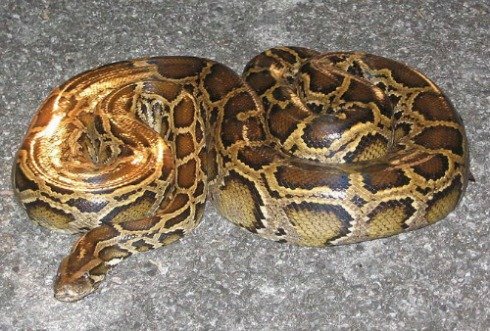 People need to understand the cause and effect of their actions, especially when non-native species such are pythons are released into the wild. The results can be catastrophic, and as history has proven, they're usually permanent.